Improper Court Elevation, No Swales or Berms. 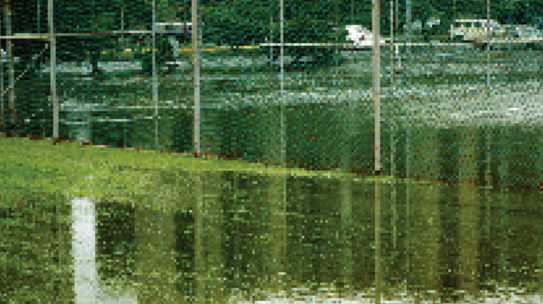 It cost more to rebuild this court than to build it improperly. 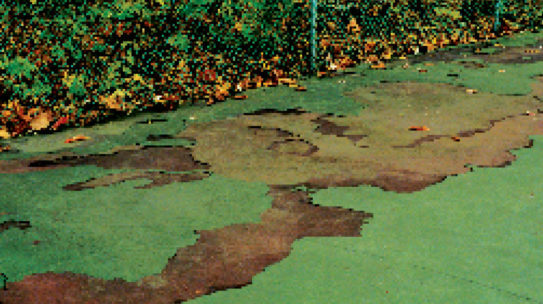 Random court cracking. Poor base construction. 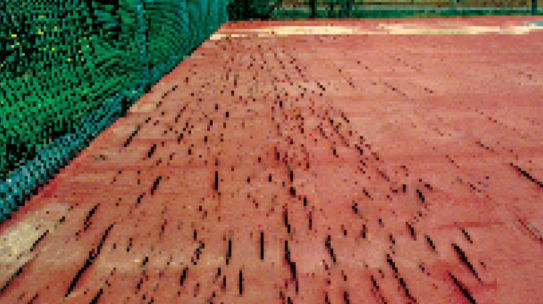 Square net posts cause radiating cracks ruining court. 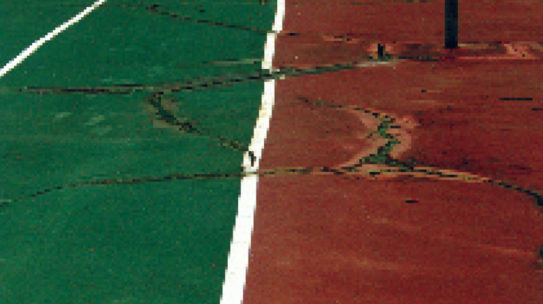 Poor joints, multiple cracks, and irregular paving surface make tennis play virtually impossible. 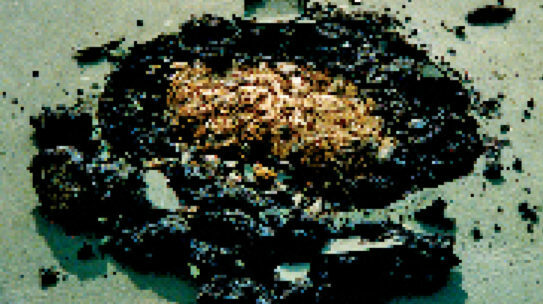 Subsurface mushroom growth. Poor base prep. Unrepairable birdbaths. Poor slope and planarity. Structural cracks in joints. 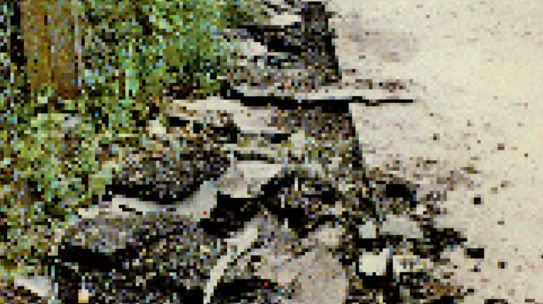 Improper paving quantities & paving techniques. Acrylic surface failure. Poor asphalt prep and surfacing mixes. 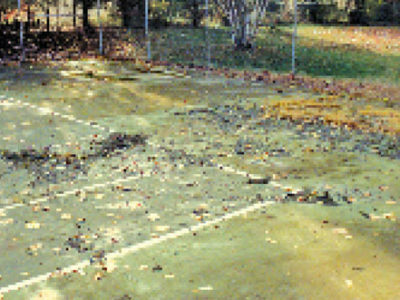 No one should end up with a court like these, yet 50% of our business is repairing courts built improperly by other contractors. 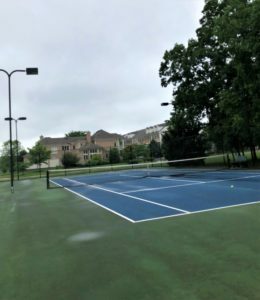 Our experienced crews can build new courts that perform flawlessly as well as renovate problem courts like these. You’ll be back on the court in no time! 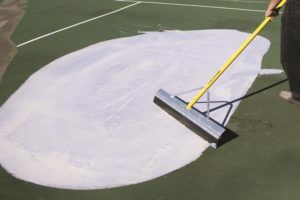 All weather tennis courts require routine resurfacing every four to six years depending upon the amount of play and environmental conditions such as the amount of leaf fall on the court, shade, etc. 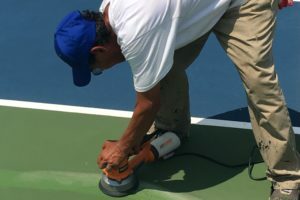 In addition to performing routine resurfacing, some “interim repairs” such as pressure cleaning and crack repairs should be anticipated between resurfacing cycles. 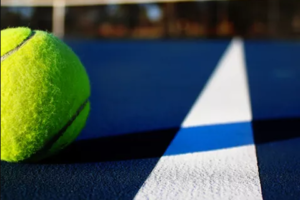 The purpose of coating a tennis court is to prevent the harmful oxidation and wear of the asphalt surface and to provide sure-footed traction and consistent ball response. 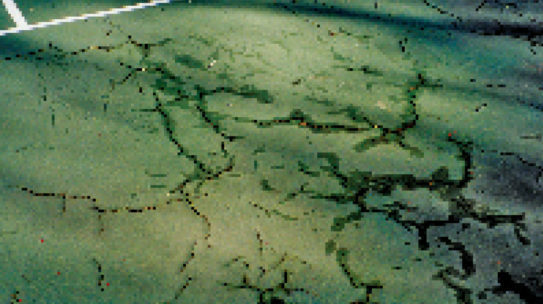 If you neglect routine resurfacing and interim crack repairs, you should plan on incurring the major expense of an asphalt overlay. 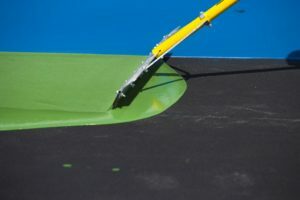 Like any restoration procedure, the prep work required in resurfacing work is the most critical part of the job. 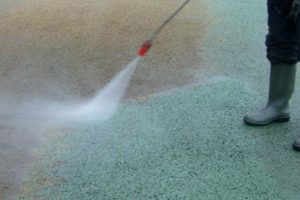 Pressure cleaning, patching, crack filling, etc. 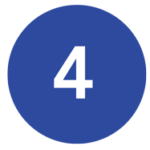 constitute the major portion of the resurfacing expense. 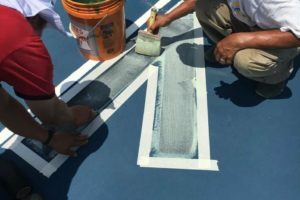 The actual application of the coatings is the easy part. 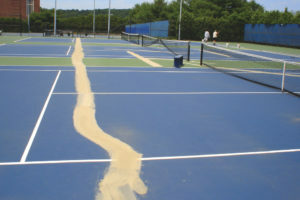 Installing new coatings without preparing the base properly is a waste of money. 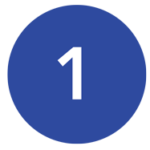 No coating will perform, for any length of time, if it is placed over an improperly prepared base. 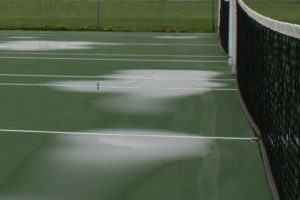 The premature delamination of coatings will adversely affect both court durability and playability. 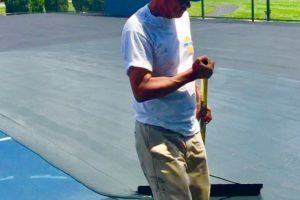 If you can’t afford to perform proper base prep work, hold off on the resurfacing job until you can. 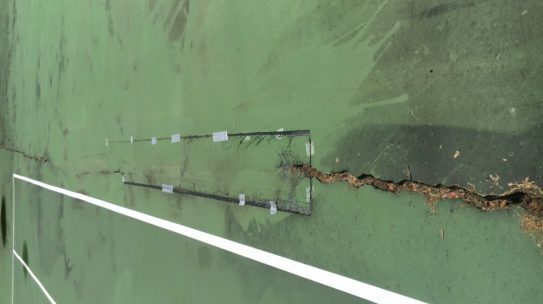 Note: Tennis court cracks can only be permanently remedied with an asphalt overlay. 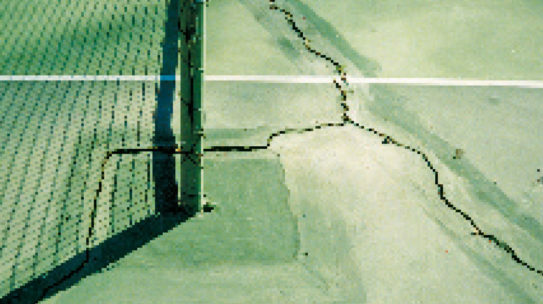 Cracks repaired in conjunction with routine resurfacing or during interim court repair work are temporary in nature. Thorough Base Prep Is Essential! Crack repairs are temporary in nature. 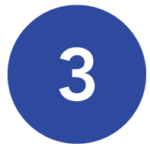 However, using correct repair techniques and quality elastomerics will maximize performance. 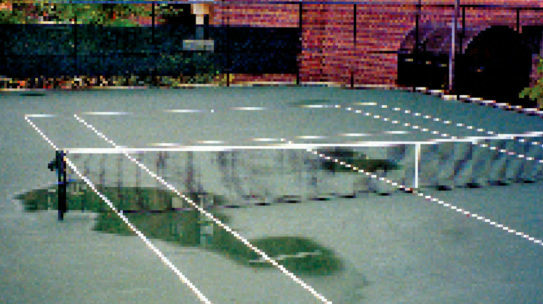 Asphalt overlays are performed to restore courts with major structural cracks, wavy and irregular pavement, excessive surface deterioration, and other factors that cannot be remedied through interim court repair techniques or routine resurfacing. 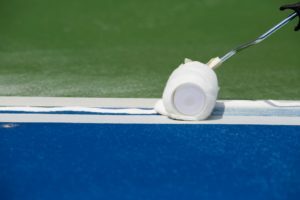 There are two major types of overlay techniques that will provide long term, trouble-free performance to even the most dilapidated tennis courts. 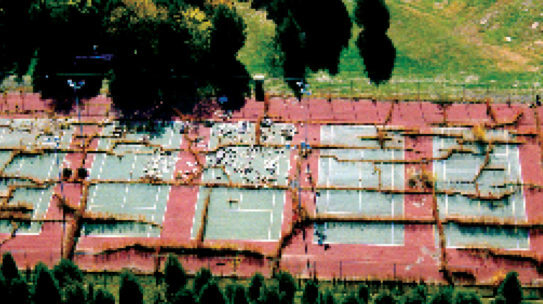 The overlay techniques described below have replaced the outdated approach of ripping out entire courts and reconstructing them from scratch. 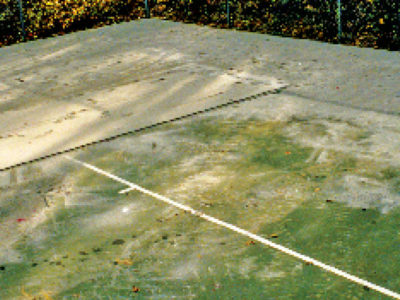 This technique, often termed a “Slipsheet Overlay”, is an excellent way to renovate old courts that exhibit multiple structural cracks and other surface problems. 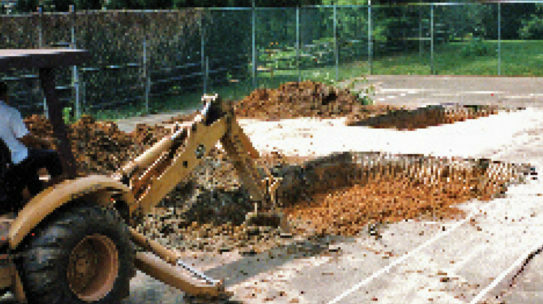 (Net Post Footings, Center Anchors and Fences are frequently replaced or modified during both types of overlay procedures). Stone dust is placed over the existing courts to an approximate depth of 1” and is compacted with a roller. 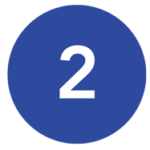 The stone dust layer serves as a leveling course for the new pavement layers, while more importantly, dissipating the upward force of the existing cracks. 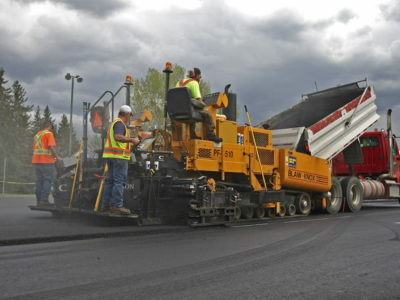 This virtually eliminates reflective cracking into the new asphalt section. 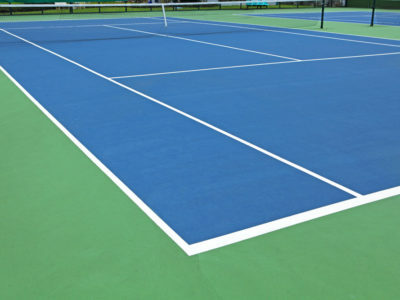 When the asphalt has cured, a new acrylic playing surface and lines are installed.